Your Wedding Cake, Birthday Cake and Graduation Cake Headquarters - We have the BEST Cakes in town! a Bakery Fresh cake from Ken's. Freshly made Ice Cream Cakes for your next special occasion! And we have a nice assortment of Holiday ice cream cakes as well. 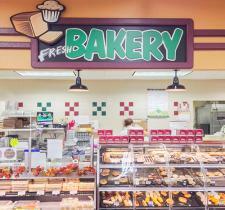 For all specialty bakery needs stop in and visit with Sam.